Sharjah, UAE-based Volga-Dnepr Gulf (Volga-Dnepr Technics’ Middle East subsidiary) completed a round of MRO works on three Boeing 747-400s for Eaglexpress Air. The contract with the Malaysian charter airline covered base maintenance up to А4-Сheck, Out-of-Phase Routine Tasks and AD/SBs. Registered in Malaysia, Eaglexpress is based in Jiddah, Saudi Arabia. 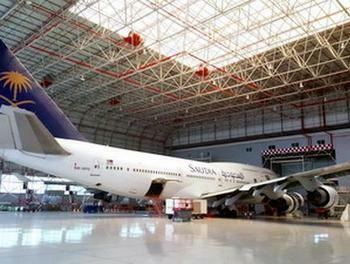 Its aircraft, four aging 747-400s, are wet-leased to local airlines, Saudia Airlines and FlyNas. The Russian MRO provider is counting on prolonged partnership with the Malaysian customer, which expressed a firm intention to grow its fleet. The carrier’s officials confirmed that it expects to take delivery of an Airbus A330-200 before year-end and two Вoeing 747-400s in 2016. By 2019 Eaglexpress’ fleet will supposedly grow to 30 aircraft: 6 Вoeing 747-400s, 12 Airbus A330-200s and 12 Boeing 737-800s. Volga-Dnepr Gulf is “in negotiations regarding long-term contract for providing MRO services for its partner’s new aircraft types,” the company said in a statement. Its MOA covers, besides the Boeing 747, the 737CL/NG, Airbus A320 (line maintenance) and several Russian-built types, for both Russian and international carriers. The Sharjah facility can service simultaneously two 747-sized aircraft, or 6 narrow-bodies. Another facility is located in Fujeirah, and specializes in servicing Antonov An-24/26, An-74 and Ilyushin Il-76.